Celebrate the beginning of a new partnership between the City of Waukegan and the Lak e County Audubon Society. Sharing Our Shore – Waukegan is a Beach Stewardship program. 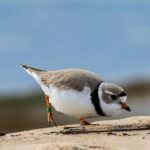 The program goals include monitoring bird species and increasing public awareness of the need for bird conservation at the special dunes habitat of Waukegan Beach. Refreshments will be provided. Take the Plover Pledge and commit to helping shorebirds by being a Plover Pal. Visit the Beach Stewards at the informational table. They will be present at the beach on May 4 and every Saturday from 1-3pm in May – July.